Scan a BUZZCOIN symbol from box of cereal with mobil or tablet device to win $10,000.00 for you and for a charity! 18,000+) Instant Win prizes go by “tier” and range from $3 ARV Sheet of Temporary Tattoos, to XBox One X ARV $500. 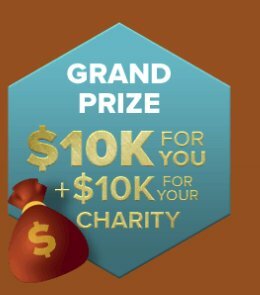 $10,000 check and $10,000 donation to charity selected.